Wow. Okay. It took me a couple of hours—by couple, I mean 6+ hours—to recuperate. I never felt a strong attachment to fictional characters since probably Big Hero 6 (the feels are strong in that movie okay?). The last episode, Ken, is an emotional roller coaster. Can I take a moment and say that I love the placement of the opening credits? LOL. I mean we see it hundreds of times, but to see it in the same space as the animated story, I had to pause and admire (and buffer the video haha). Anyway, I was getting teary-eyed 3 minutes into the episode and basically broke down 10 minutes in. Give the voice actor of Hide, Toshiyuki Toyonaga, an award! The way he said “I knew” pulled my heart strings. Add on to the fact that Hide managed to carry Kaneki to Anteiku, make coffee, and chat with him until everything seemed like before Kaneki’s life got screwed up… excuse me, I have something in my eyes. Aside from the 10 minutes of gut wrenching sadness, the episode’s pacing seemed off and there were a few animation goofs. The season itself has a lack of character development and incoherent storytelling. It is a clusterfluff of WUT. We don’t ever see Kuro, Shiro, and Donato again. Don’t even get me started on Banjou, Rize, and Kanou. Tsukiyama’s appearances serve no purpose but it could should have. I wanted to see how Aogiri functions, what their base looks like, and know more about the members like Noro and Tatara. I was expecting to see these because Kaneki joined Aogiri, but I guess I will just have to find out in :re or possibly season 3 (more about that later). Okay, I need to stop ranting about everything that is wrong with √A. I do think, however, √A does a good job portraying the notion of reliance. We see this theme in Shinohara and Juzou’s relationhip, Akira and Amon’s, Hide and Kaneki’s… the list continues. I think it’s great √A emphasizes the relationship between Kaneki and Hide because it goes back full circle to the first episode of season 1 and further solidifies their friendship. 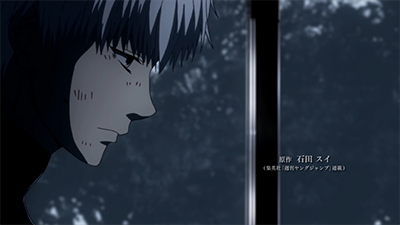 In the manga, Kaneki has his other ghoul friends to rely on, but in √A, he struggled alone. 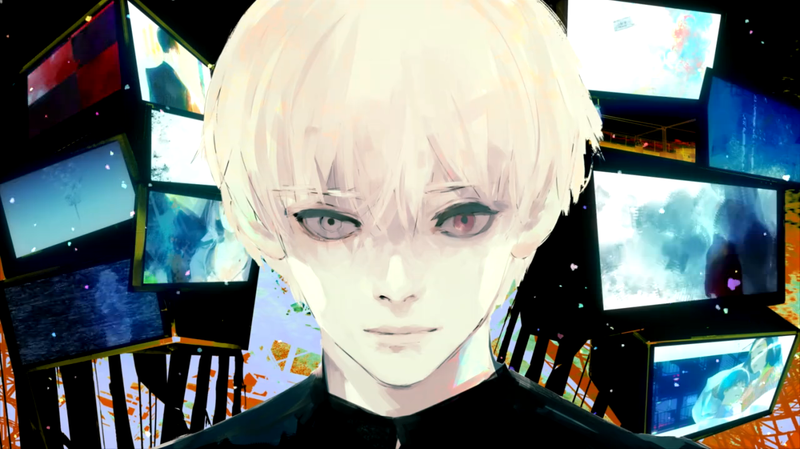 Kaneki regains his humanity because of Hide, as shown metaphorically when his white hair turns black. Hide is his only connection left pre-ghoul life, and it seems fitting that this friend, who has been by his side since childhood, helps him regain his human side. I feel like we often forget that Hide suffered as well. Hide said “there wasn’t anything I could do on my own.” He continuously searched for Kaneki, not knowing whether his friend was truly okay or not. He was just as lonely as Kaneki. They needed each other. It begs the question, did Kaneki and Arima fight at the end? What is home to Hide and Kaneki? Are Hide and Kaneki dead? Anteiku was essentially a home/haven for ghouls and Kaneki, especially in season one, but now it’s gone, where can Kaneki go? Although the possibility of Arima vs. Kaneki battle is implied with Arima’s quinque in the snow, to me, it doesn’t make sense to show Kaneki’s humanity returning only to lose it to his ghoul side again. I think Kaneki surrendered because possibly he thought CCG was Hide’s home. It would make some sense and lead into :re’s storyline with Kaneki retaining his memories. Add to the fact Kaneki approached the scene in a nonthreatening manner with his face unmasked; his whole posture screams “LET’S BE FRIENDS” (okay, not really but you get the idea). Moreover, it wouldn’t make sense to have Arima and Kaneki attack each other when there is an injured Hide between them. 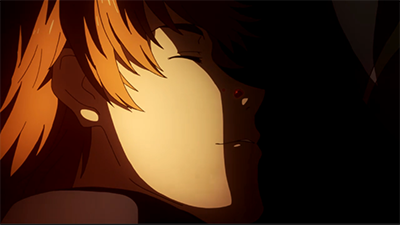 I watched the episode so many times and I honestly believe Hide is not dead because he reacts and smiles when Kaneki’s tear fell on his cheek. For a second I thought oh hey, Kaneki’s regeneration powers transferred over, but that is a super crack theory. I like to believe Kaneki only covered Hide with the white sheet to protect him from the fire, but at the same time it could signify that Hide’s dead. I don’t know, I prefer to think the former since that means happy ending-ish for both of them. Snowfall makes us feel, sentimental, vulnerable love, sadness, weakness, or ending… it represents a sadness which you feel when you are experiencing a very hard problem and you yourself can’t do anything about it. The described term “impermanence” [from wabi-sabi] is the most accurate concept to express this unique sentimental feeling. Overall I think √A had potential with the new direction, but it somewhat fell through. If only it had 24 episodes like other anime, then I think we would see fleshed out characters and most likely more gut wrenching scenes. Hey, isn’t that what Tokyo Ghoul is about? Ruining our lives by making us emotionally invested in fictional characters? There has been talk about season three, which part of me is excited but the other part of me is NOO, PLEASE DON’T MAKE THEM SUFFER ANYMORE. LET THEM PRANCE AND HAVE RAINBOWS AND SUNSHINES. If you got all the way to the bottom, thanks for reading!